LingvoSoft Suite English <-> Tagalog (Filipino) (Philippines) for Windows Mobile is a universal language management and translation solution for devices running Windows Mobile. This fully integrated collection of the most popular and efficient LingvoSoft titles answers the needs of anyone who uses foreign languages for business, travel or study. 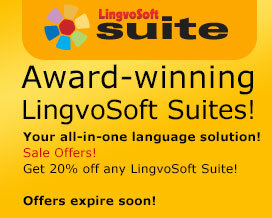 The LingvoSoft Suite English <-> Tagalog (Filipino) (Philippines) for Windows is a dynamic language learning and translation solution for your desktop or laptop PC. This remarkable utility answers all the needs of almost any user of foreign languages. Businesspeople, travelers, students, and professional translators will all benefit from its wide range of unique features. Fully-integrated and compatible with the most popular MS Office applications (Word, Internet Explorer and Excel), it extends the functionality of your existing word processing and internet tools with the added benefit of instant translation. LingvoSoft Talking Dictionary English <-> Tagalog (Filipino) (Philippines) for Windows Mobile is a fast and convenient translating dictionary that travels wherever you go. As part of a complete language learning and management solution for your Pocket PC it delivers instant bi-directional translation of all the words and phrases in its massive database. As one of the most sophisticated language resources available for Windows Mobile it supports Square screens, High Resolution screens and along with being Windows Mobile Version 5.0 compatible it also allows for screen rotation to make it comfortable to use under any circumstance. LingvoSoft Talking Dictionary English <-> Tagalog (Filipino) (Philippines) for Windows is part of a complete language learning and management solution for your PC. Providing instant bi-directional translation of all the words and phrases in its massive database, it is one of the most complete language resources ever designed. Once installed on your desktop or laptop PC this remarkable dictionary not only translates between English and Tagalog (Filipino) (Philippines) but also speaks the English translation out loud using the latest TTS (text-to-speech) technology. The Talking PhraseBook English <-> Tagalog (Filipino) for Windows is part of a unique suite of language learning applications for your PC. It provides nearly 14,000 travel-oriented phrases and instantly translates in either direction between English and Tagalog (Filipino). But what makes this PhraseBook truly remarkable is that its contents can be spoken aloud in both languages using natural human voicing as recorded by native speakers. LingvoSoft Talking PhraseBook English <-> Tagalog (Filipino) (Philippines) for Windows Mobile is the most convenient and functional phrasebook ever invented. Its ability to speak any of its 14,000 phrases aloud using digitally recorded native-speaker voice narration means that you will always be understood – even if you can’t speak a word of another language. LingvoSoft Dictionary English <-> Tagalog (Filipino) for Windows is part of a complete language learning and management solution for your PC. Providing instant bi-directional translation of all the words and phrases in its massive database, it is one of the most complete language resources ever designed.